Periodontal disease, more frequently called gum disease, plagues nearly 70 million people in the US. Science is rapidly finding the associations between gum disease and other serious systemic diseases. Most recently, gum disease was linked with faster Alzheimer disease decline. And so, now more than ever, it’s becoming increasingly clear that your oral health affects your entire well-being. This makes preventing and reversing a diagnosis of gum disease a call to action. 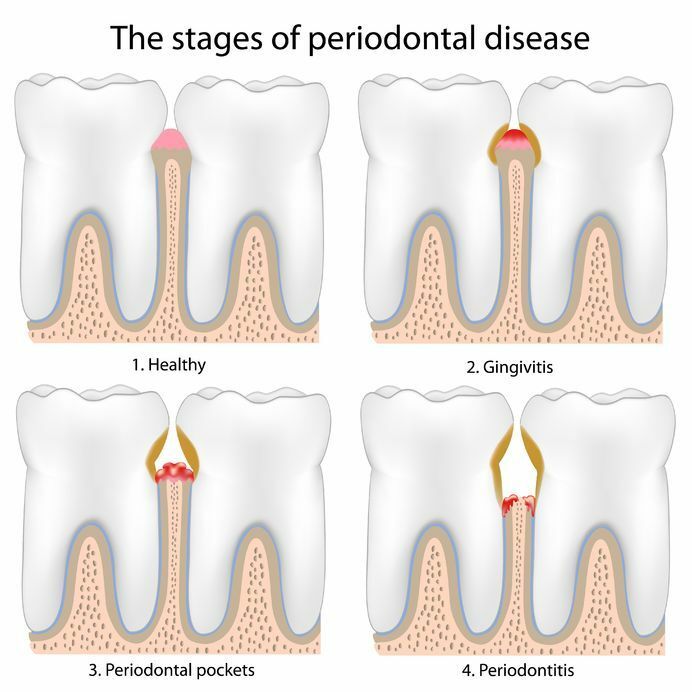 Periodontal disease is when the gums get infected by plaque and bacteria buildup and pull away from the teeth. There are 4 levels of gum disease. The gums, around your teeth, begin to get infected by plague and bacterial buildup. At this level patients will often notice periodic bad breath, red and swollen gums, and blood when brushing or flossing. This first level is reversible with regular practice of good dental habits (brushing and flossing) along with regular checkups and dental cleanings. At this point, the bacteria infecting your gums goes deeper affecting more gum tissue and bone. At this point, daily oral hygiene will not halt the further progression of gum disease. Interestingly, the symptoms of the disease at this stage can be silent. While there may increasing bleeding and swelling, most of these symptoms can go unnoticed. The true determination of what the level of periodontal disease is at this point, can only be determined by your dentist. She or he will probe your gums and the depth to which she/he can go determines if you are at a level 2 gum disease stage or level 3. The final stage leading to tooth loss and dentures, it also increases other systemic diseases. This is truly a critical disease at this point requiring surgical and laser interventions. Regular brushing and flossing are a strong foundation for good oral health. Regular dental checkups and routing cleanings are also part of the maintaining a healthy mouth. Your dentist will recommend a dental deep cleaning to address any signs of periodontal disease. The procedure involves scaling and root planing. It may require some anesthetic to numb the area. The dentist will then remove all the calculus, debris, bacteria, and plaque that are above and below the gum line. They will also remove bacteria from the root of the tooth. You may also be prescribed an antibiotic as part of the follow up. Dental deep cleanings are a powerful and can reverse the early and mid-stages of periodontal disease. Call our office at 773-831-0002 to schedule a consultation if you think you have or have been diagnosed with periodontal disease. You can also schedule your dental consultation online.